Reading of Greek in the Synagogue. Emperor of the Eastern, or Byzantine, Empire from 527 to 565. During his long reign he issued many decrees relating to the Jews, and his empire was the scene of bloody events which were of the greatest importance for both the Jews and the Samaritans. In his dealings with the Jews Justinian was guided, not by political and diplomatic principles, but rather by consideration for the Orthodox Church. The unfortunate history of the Samaritans under Justinian is noteworthy. Their rebellious attitude under Zeno continued unchanged under Justinian (Procopius, "De Ædificiis," v. 7 [p. 325, ed. Bonn]). The Christian church built on their sacred Mount Gerizim was especially an object of offense. They were apparently very restless at this time, for their name and deeds occur frequently in the contemporaneous history of the empire. A Samaritan from Palestine, Arsenius by name, rose to high honors through financial transactions with the empress Theodora, and was made senator after having accepted baptism. When his father and brother at Scythopolis oppressed the Christians, the Samaritans were cruelly killed by the angry populace, and all the other Palestinians also were harassed. Although Arsenius was banished from the court, he did not suffer otherwise at the time, and he was crucified only after his intrigue at Alexandria (Procopius, "Historia Arcana," ch. 27, p. 150). Another Samaritan, Faustinus, was a senator and became proconsul; he managed the imperial domains in Palestine and Phenicia (ib. ch. 27, p. 153). In consequence of their favorable position and their numerical strength, the Samaritans were emboldened to take up arms. The cause of this uprising is said to have been as follows: It was customary in Palestine and everywhere in the East, on every Sabbath, after the reading of the Gospel lesson in church, for the Christian young men to enter the synagogues of the Samaritans, mock them, and throw stones at their houses. This happened about 530 in the capital of the Samaritans, Neapolis, or Nablus, when the Christian young men were driven with swords and knives out of the synagogue, pursued to the Church of St. Basil by the furious Samaritans, and killed. When Justinian was informed of this occurrence, he ordered Irenæus, the commander of the town, to punish the Samaritans. Irenæus had to apply to the "dux" of Palestine, Theodorus the "great" (so called probably on account of his victory over the Samaritans). The governor killed many of them; others were sold throughout Palestine as slaves, and their houses demolished; Julian, son of Sabarona, or Samaron, whom the Samaritans had chosen as their "king," also was killed, and his head, together with the diadem and other insignia of royalty, was sent as a trophy to Justinian at Constantinople ("John of Antiochia," printed in "Hermes," vi. 376). This rebellion, but without the antecedent events, is similarly referred to in an almost contemporaneous chronicle ("Chronicon Paschale," 336 [p. 619, ed.Bonn]). The chronicle adds: "and many of them accepted Christianity and were baptized, either from fear or by force; but even to-day they vacillate in their faith." Malalas ("Chronicle," xviii. 445) has a different version; according to him, the quarrel broke out in the hippodrome of Nablus, where Jews and Samaritans were racing together, both of these combining against the Christians. "Dux" Theodorus immediately reported the quarrel to Justinian; the prefect Bassus, who could not quell the disturbance, was dismissed, and the insurgents were ultimately vanquished; 20,000 fell on the field, and 20,000 were presented to the Saracen Phylarchus, who had assisted in quelling the uprising. The final outbursts of revolt were suppressed by Dux Irenæus. Malalas evidently refers to an entirely different event, and the story relating to the circus must be separated from that relating to the synagogue. Theophanes likewise ("Chronogr." i. 274) relates, not the rebellion beginning in the circus, but that under Julian, giving the year 521, which, probably, should be read 531. As an epilogue to the rebellion the fugitive Samaritans endeavored to incite the Persian king Chosroes to war against the Romans by offering him their country as well as an army of 50,000 Jews and Samaritans. Whatever may have been the details of these events, it is evident that the Samaritans offended grievously against the emperor and the empire. Procopius ("Historia Arcana," ch. 27, pp. 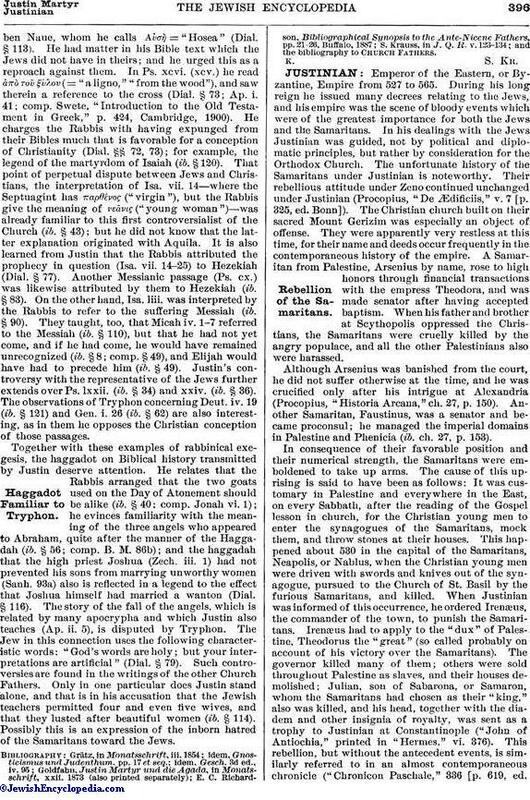 150-153) relates still another uprising, in which the Jews and Samaritans fell upon the Christians in a circus at Cæsarea and killed the governor Stephen; this uprising was suppressed in July, 556, by Adamantius, or Amantius. The consequences of persistent rebellion were soon felt. In 532 the emperor issued a decree to the effect that in cases of dispute the Jews could act as witnesses against one another, but not against Christians; heretics, including Samaritans, could not act as witnesses even against one another ("Corp. Juris," i. 5, 21). "The synagogues of the Samaritans shall be destroyed, and if they dare to build others, they shall be punished. They may have no testamentary or other legal heirs except Orthodox Christians" (ib. i. 5, 17; comp. i. 5, 18-19). They were forbidden to leave legacies or presents. In 551, Bishop Sergius of Cæsarea succeeded in softening the emperor's severity toward them and securing the repeal of these disgraceful laws (Novella 129). In other respects the status of the Jews and Samaritans was the same. Novella 45 of the year 537 begins as follows: "Relating to the law that Jews, Samaritans, or heretics are not to be exempt from the office of magistrate on pretext of their belief, but that, on the contrary, they shall bear the burdens of the magistracy without enjoying its privileges." In 545 it was ordained that no heretic should, under any circumstances, acquire real estate from a church or religious institution. "If an Orthodox Christian has sold or willed to a Jew or pagan or Arian a piece of land on which there is a church, the church of that locality shall seize such property." "Heretics may not build a 'spelunca' for their heresies, nor may the Jews erect any new synagogues" (Novella 131, ch. 14). The following decrees were issued in favor of the Orthodox Church in newly conquered Africa: "Jews may not keep Christian slaves, nor may they make proselytes by circumcision." "Their synagogues shall be rebuilt in the style of churches." "Jews, pagans, Arians, and other heretics may not have 'speluncas' nor observe any of the ceremonies of the Orthodox Church" (Novella 37, of the year 535). The emperor interfered also with the religious life of the Jews. He forbade them to celebrate their Passover if it fell on the same day as the Christian Easter, because there was still a Christian sect, the Quartodecimani, that celebrated Easter at the time of the Jewish Passover. Jews in high positions who did not conform to this law were fined (Procopius, "Historia Arcana," ch. 28, p. 156). 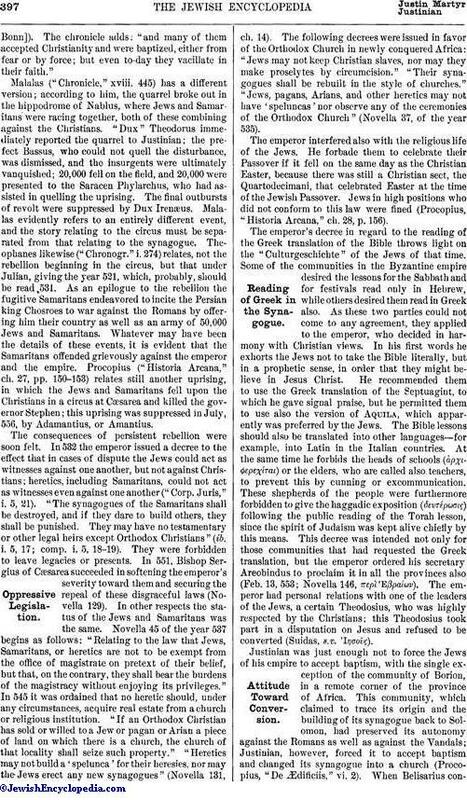 The emperor's decree in regard to the reading of the Greek translation of the Bible throws light on the "Culturgeschichte" of the Jews of that time. Some of the communities in the Byzantine empire desired the lessons for the Sabbath and for festivals read only in Hebrew, while others desired them read in Greek also. As these two parties could not come to any agreement, they applied to the emperor, who decided in harmony with Christian views. In his first words he exhorts the Jews not to take the Bible literally, but in a prophetic sense, in order that they might believe in Jesus Christ. He recommended them to use the Greek translation of the Septuagint, to which he gave signal praise, but he permitted them to use also the version of Aquila, which apparently was preferred by the Jews. The Bible lessons should also be translated into other languages—for example, into Latin in the Italian countries. At the same time he forbids the heads of schools (ἀρχι περεχίται) or the elders, who are called also teachers, to prevent this by cunning or excommunication. These shepherds of the people were furthermore forbidden to give the haggadic exposition (δευτέρωσις) following the public reading of the Torah lesson, since the spirit of Judaism was kept alive chiefly by this means. This decree was intended not only for those communities that had requested the Greek translation, but the emperor ordered his secretary Areobindus to proclaim it in all the provinces also (Feb. 13, 553; Novella 146, περὶ Ἑβραίων). The emperor had personal relations with one of the leaders of the Jews, a certain Theodosius, who was highly respected by the Christians; this Theodosius took part in a disputation on Jesus and refused to be converted (Suidas, s.v. Ἰησοῦς). Justinian was just enough not to force the Jews of his empire to accept baptism, with the single exception of the community of Borion, in a remote corner of the province of Africa. This community, which claimed to trace its origin and the building of its synagogue back to Solomon, had preserved its autonomy against the Romans as well as against the Vandals; Justinian, however, forced it to accept baptism and changed its synagogue into a church (Procopius, "De Ædificiis," vi. 2). When Belisarius conqueredAfrica, in 534, the sacred vessels of the Temple were carried to Constantinople; but when a Jew said that these vessels had brought misfortune upon all those that had possessed them, the superstitious Justinian sent them to a church at Jerusalem (Procopius, "Bellum Vandalorum," ii. 9). Since the Jews had good reason to fear the Byzantine rule, it is not surprising that they should oppose Justinian's armies at Naples. Justinian, whose reign so greatly affected the Jews, is hardly mentioned in the Jewish sources. A passage in a responsum of the Geonim relating to the interdiction of the reading of the Torah refers, according to Grätz, to Justinian's decree, but it may be more correctly referred to Yezdegerd's interdiction (Halberstam, in Kobak's "Jeschurun," vi. 126). The Samaritans, for whom Justinian's reign became fateful, do not mention him at all in their chronicles. 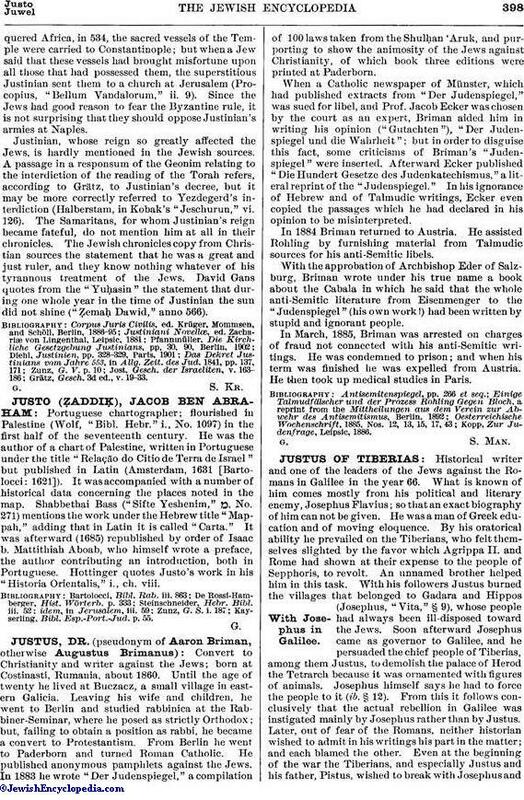 The Jewish chronicles copy from Christian sources the statement that he was a great and just ruler, and they know nothing whatever of his tyrannous treatment of the Jews. David Gans quotes from the "Yuḥasin" the statement that during one whole year in the time of Justinian the sun did not shine ("Ẓemaḥ Dawid," anno 566). Grätz, Gesch. 3d ed., v. 19-33.